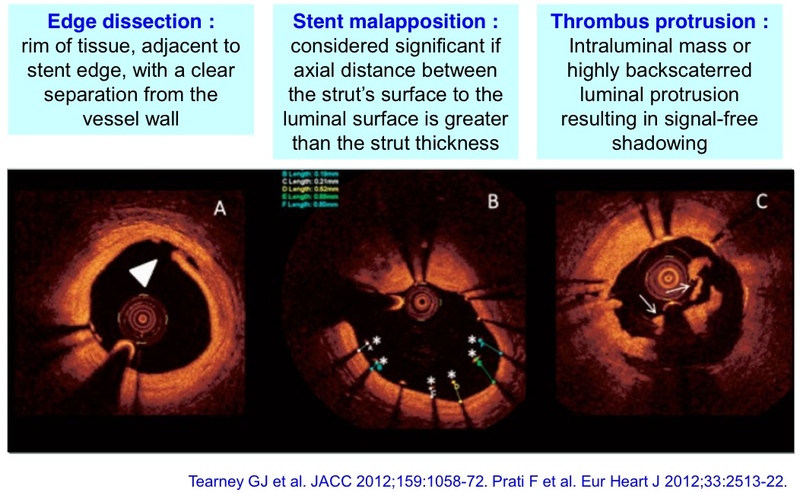 • OCT may have potential advantages as compared to angiography or IVUS for the analysis of lesion characteristics (1,2). • OCT has emerged as the ideal imaging tool for the assessment of superficial components of coronary plaques and vascular response to PCI (3). • OCT is used to evaluate vulnerable atherosclerotic plaques and assess immediate and long term results of stenting with a view to further optimizing outcomes (1). 1. Tearney GJ et al. JACC 2012;59:1058-72. 2. Habara M et al. Circ Cardiovasc Interv 2012;5:193-201. 3. Raber L et al. Eurointervention 2012;8:765-71. Real clinical impact of OCT findings ? Can OCT-guided PCI improve clinical outcomes? Angiography alone versus angiography plus optical coherence tomography to guide decision-making during percutaneous coronary intervention: the Centro per la Lotta contro l’Infarto-Optimisation of Percutaneous Coronary Intervention (CLI-OPCI) study. Francesco Prati, MD; Luca Di Vito, MD, PhD; Giuseppe Biondi-Zoccai, MD; Michele Occhipinti, MD et 7 autres. Patients undergoing PCI with angiographic plus OCT guidance (OCT group) compared with matched patients undergoing PCI with angiographic only guidance (Angio group). Primary endpoint : one-year rate of cardiac death or myocardial infarction (MI). Additional stenting (edge dissection, residual narrowing) : 12.4%. Prati F et al. EuroIntervention 2012;8:823-29. Can OCT-guided PCI improve clinical outcomes? Angiographic + OCT guidance was associated with a significantly lower one-year risk of MACE. It remains to be investigated whether the use of additional interventions will translate into a benefit in clinical terms. To date, no randomized study has investigated the value of OCT in optimizing the results of angioplasty, specifically in the context of NSTE-ACS. Kume T et al. Am J Cardiol 2006;97:1713-7. • will impact on the functional result of angioplasty as assessed by fractional flow reserve (FFR) measured after stent implantation on a lesion responsible for NSTE-ACS. • Functional result of the angioplasty procedure as assessed by FFR measured at the end of the procedure (the average of 3 consecutive measures will be recorded and compared between groups). Quantitative OCT variables that best predict final FFR measurement MACE at 6-month clinical follow-up. • AND presenting an indication for coronary angioplasty with stent implantation of the target lesion (single lesion on the culprit artery without diffuse disease on the same vessel) considered to be responsible for the ACS. • AND written informed consent. • Patients who refuse to sign the informed consent form. • Intracoronary bolus of 200 mg ISDN to prevent coronary spasm. • PCI performed according to current guidelines*. • Pts pretreated with aspirin and clopidogrel (loading dose of 600 mg) or other P2Y12 receptor inhibitor. • The choice of anticoagulant (UFH, LMWH, bivalirudin) and option to use GP IIb/IIIa inhibitors at operator’s discretion. • Aspirin + clopidogrel (or other P2Y12 inhibitor) maintained for 1 year after the procedure. • OCT images will be acquired using the FD-OCT C7XR system (Lightlab Imaging Incorporated, Westford, MA) and 6F guide catheter compatible Dragonfly Duo catheter (St Jude Medical). • All OCT images will be centrally analyzed in the coordinating center by 2 independent operators blinded to the angiographic findings, procedural strategy, and final FFR value. • OCT criteria for the definition of the end points were defined according to recent recommendations and established definitions (International Working Group for IVOCT & Expert’s OCT Review Document). 1. De Bruyne. NEJM 2012;367:991. – Increased use of stents : greater troponin release ? – Greater volume of contrast medium : deterioration of renal function ? • RCT assessing the impact of OCT on procedural or cardiovascular outcomes have never been performed. 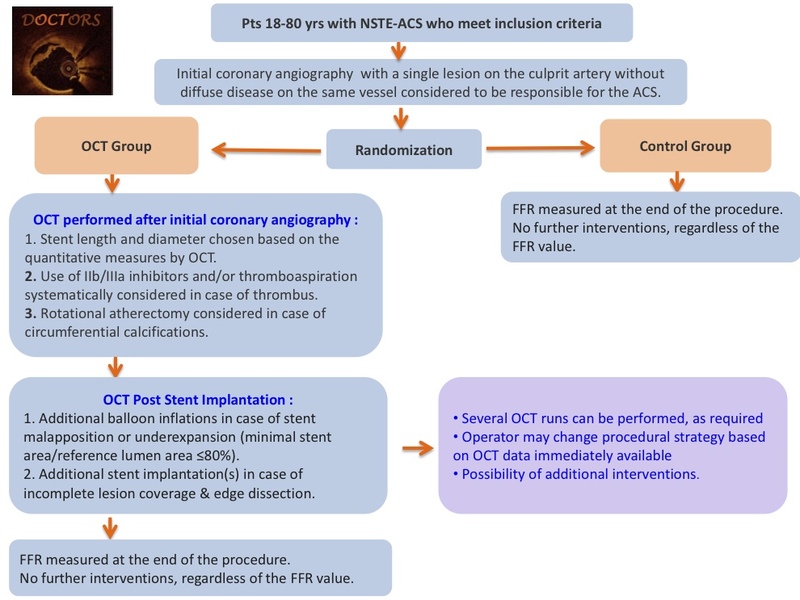 • To evaluate whether OCT guidance during angioplasty with stent implantation will provide useful information beyond that obtained by angiography alone and whether this information will impact on the functional results of angioplasty as assessed by FFR measurement in NSTE-ACS pts. 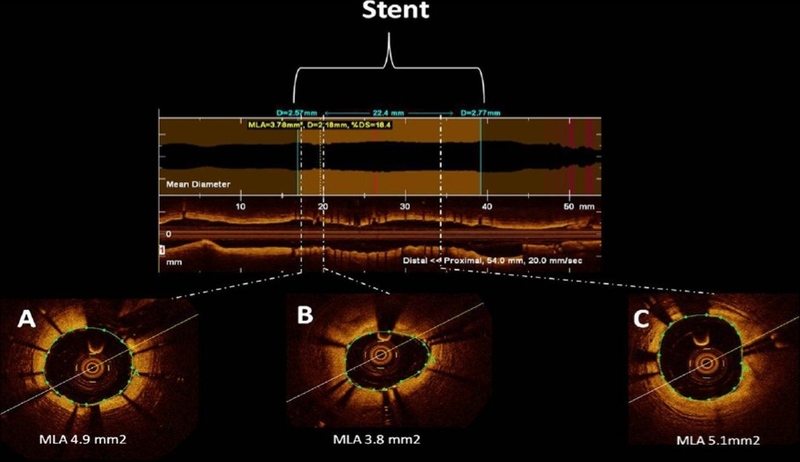 Does optical coherence tomography optimize results of stenting? Rationale and study design.